Nintendo celebrates water in all its form and splendor in Fluidity, a WiiWare platformer and the star of this week's Nintendo Download. Fluidity puts the player in control of a heroic pool of water, navigating the ancient and mystical Aquaticus encyclopedia to rid it of corruption. 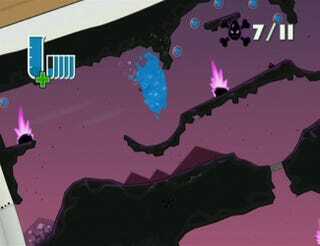 Twisting the Wii remote rotates the world, allowing your puddle to traverse obstacles and take on enemies, while some levels explore the other states of water, ice and steam. It looks like a blast, and if the 1,200 Wii point price tag is a bit high there's also a demo to try before you buy. Other highlights this week include the Virtual Console release of Commando, Space Ace for DSiWare, and Fireplacing, the WiiWare title that attempts to make the act of having a fireplace running on your television screen into a verb.